The European Union (EU) aims to develop “special relations” with the eastern and southern neighbourhood of the enlarged EU. What exactly these privileged and special relations entail is still not clear, and the tailored Action Plans do little to clarify this point. Almost fourteen years after launching the European Neighbourhood Policy (ENP), it is time to take stock of the relations between the EU and its target countries. “One size fits all” is old news. Focusing on the eastern dimension of the ENP, this paper examines Germany’s internal media perception of individual EU relations with the “near” neighbours of the Eastern Partnership (EaP). With the interinstitutional agreement of June 2018 on key directives of the EU Winter Package, the outline of the 2030 framework of EU climate and energy policies is clearly set. 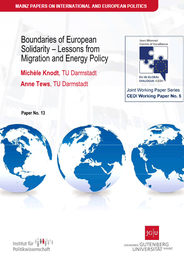 This contribution presents an overview on the outcomes of the negotiations in the fields of governance, energy efficiency and renewable energies. We review the supporting negotiation documents and present a screening of stakeholder reactions to the new 2030 framework. 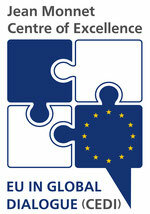 The European Union (EU) takes pride in having promoted integration, peace and democracy among its member states. This European success story, as perceived by third states interacting with the EU, has a huge bearing on the Union’s soft power and thus on the effectiveness of its Common Foreign and Security Policy (CFSP). The British decision to leave the EU however tarnishes this image and might stir fears and resistance, but also hopes. Nevertheless, thus far, neither the scholarly nor the public debate has paid sufficient attention to third countries’ reactions to the Brexit. CEDI's third Annual Conference “Cities in Global Dialogue - Megacities as Partners for Development" took place from June 8 to 11 2018 at TU Darmstadt. The conference addressed the role of megacities in development cooperation. Five experts with a background in urban studies and international affairs discussed the potentials of megacities in creating solutions for global challenges. The conference concept combined seminar elements with international knowledge sharing on megacities and aimed to foster exchange between different disciplines as well as between scientists, practitioners and students. 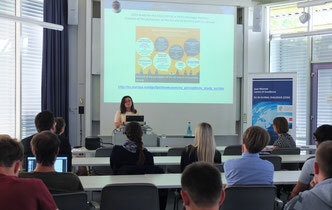 On June 26, 2018, CEDIs third Annual Lecture took place at TU Darmstadt. Guest speaker Prof. Natalia Chaban (University of Canterbury, Christchurch, New Zealand) gave a talk on "Communicating the EU as a Global Normative Energy Actor: Perceptions and Narratives"
Chaban presented her analysis of the perception of the EU as a normative energy actor by the EU's in BRICS-Countries. After the lecture, CEDI Director Michèle Knodt and CEDI Co-Director Arne Niemann presented the Awards for EU in Global Dialogue 2018. CEDI awarded two prizes to outstanding theses in political science on the topic of EU in Global Dialogue. 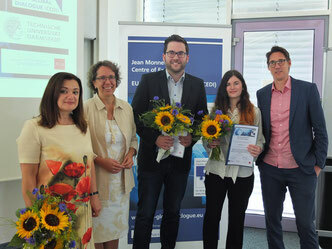 A jury selected the BA thesis of Julia Blöser (JGU Mainz) on EU asylum policy and the doctoral thesis of Simon Bauer (TU Darmstadt) on political attitudes and electoral behaviour during the Euro Crisis. 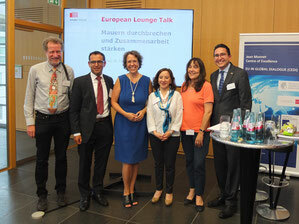 CEDI's third European Lounge talk took place on June 18, 2018 at the Schader-Forum in Darmstadt. 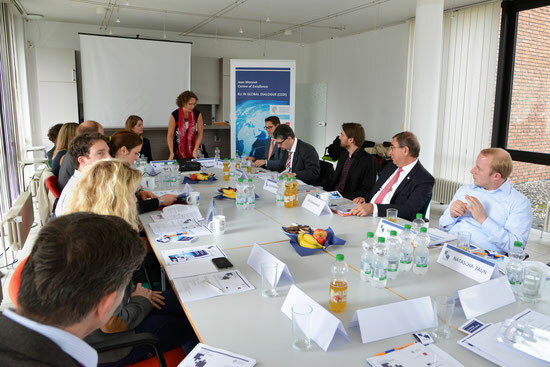 CEDI invited a keynote speaker and 4 experts to discuss experiences with knowledge sharing and lessons for German and European foreign and development policy. Dr. Rogelio Madrueño-Aguilar, Research Associate at Georg-August Universität Göttingen gave a keynote speach to introduce the topic. He discussed the challenges of Knowledge Sharing and emphasized the need for a broader concept of cooperation with regard to global public goods and global governance to foster inclusive institutional dialogue and improve intercultural dialogue. Paris has written history. The initiation of an internationally binding climate agreement serves as a wake-up call for a rapid transformation of the world's energy system (UNFCCC 2015). The implementation exposes Europe and especially Emerging Powers to a challenge, which requires a globally coordinated solution. While climate and energy policy had been treated separately in the past, Paris irretrievable interlinked these topics. 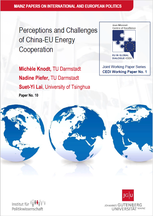 New forms of political cooperation at the climate & energy nexus between the EU and Emerging Powers such as Brazil, India, China or South Africa (BICS) are required. Yet, reality tells a different story: the EU's energy and climate policy until now were carried out separately, the EU's geographical focus in energy policy remains on adjacent countries in the European neighbourhood and on issues related to energy security. 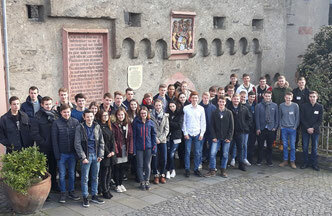 Around 120 students of the Lichtenbergschule Darmstadt were attending an expert talk with Prof. Michèle Knodt in the context of the Europe Week. The members of the advanced course on politics and economy asked about Britain in the EU and the implications of the BREXIT for the European Union. The talk followed the English theatre piece "BREXIT - A love story" about a binational couple in times of BREXIT. The UEFA Champions League as Political Myth: Unifying Europe or Alienating the Regular Football Fan? The UEFA Champions League (CL) has arguably evoked much attention, fascination as well as criticism over the years. While it quickly developed into a commercial success story and a brand name which seemed to draw financially well-endowed sponsors all too easily, it has also increasingly been criticised for its changes in format, its focus on nurturing elite clubs at the expense of grassroots football as well as already having reached some point of saturation and over-exposition towards likely spectators, fans and consumers. Beneath this discussion of the likely sporting and commercial dynamics around the UEFA Champions League, there has always been some interest in this continent-wide competition as an engine, which supposedly makes Europe hang together more closely. 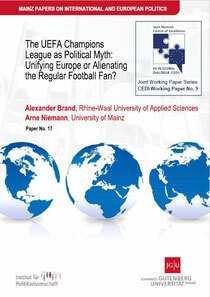 In this regard, the very idea that millions of Europeans watch games – not only of their beloved clubs, not only of their respective national sides, as research and data suggest – has fascinated and inspired political and scholarly comment. Elaborating on narratives establishing, and counter-narratives undermining such positive perceptions of the CL, we aim at uncovering the potential of top-level club football competition to function as a political myth. CEDI awards outstanding Bachelor, Master and Doctoral theses on the topics of CEDI. Around 60 participants were discussing democracy and participation at the "Café Europe" of Pulse of Europe Darmstadt. It was the beginning of the new series of events “Auf dem Weg nach NEUROPA” [On the way to a new Europe]. After an introduction by Prof. Dr. Michèle Knodt, Terenzio Facchinetti and Mike Sürder moderated a panel discussion with Michael Gahler (EVP), Member of European Parliament, Philip Krämer (Die GRÜNEN), Member of the local parliament, Andre Pfeifer, student of history and philosophy at TU Darmstadt as well as Prof. Dr. Michèle Knodt. After the discussion, the participants of the Café were elaborating ideas for better participation and more transparency in Europe. Junior Campus EU+” 2018, held from 7-8 February 2018 in Kaub, invited 43 pupils from the Elisabeth Langgässer-Highschool who slipped into the role of European Council members of the 28 European Union member states and the accession candidate Serbia. The two day simulation with preliminary meetings at the schools was moderated and guided by academic staff from CEDI and further assisted by secondary school teachers. Almost three years after the Euromaidan protests in 2013-2014, the circumstances in East Ukraine seem to be burdened by a frozen conflict. Russia is still holding on to the story that the annexation of Crimea was a “free referendum” of Ukrainian people expressing their desire to belong territorially to Russia. Unsolved conflicts and the future architecture of relations between Russia, Ukraine and the EU need to be redefined and remain a key strategic challenge for the EU. 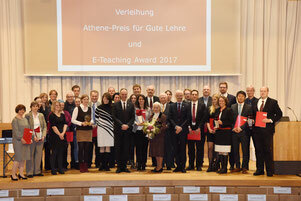 CEDI team members Michèle Knodt, Katahrina Kleinschnitger and Anne Tews received the Athene Award for excellent teaching 2017 for the preparatory seminar of the CEDI EU simulation in Mainz. 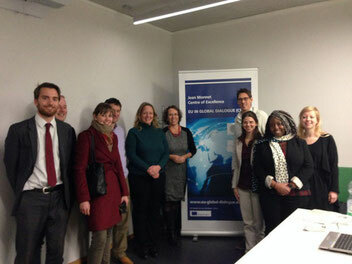 The seminar prepared students to participate in CEDIs Model EU Mainz simulation. 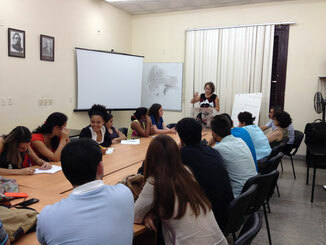 It included sessions on EU integration theory, EU institutions and the policy fields included in the simulation. In addition, students were introduced to the method of simulation and were encouraged to reflect their role in the process. 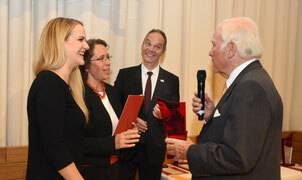 Each year, the Carlo and Karin Giersch foundation at TU Darmstadt awards innovative and outstanding teaching concepts in each department. The award encourages the development of innovative teaching methods and raises awareness for the importance of excellent teaching at the university. The CEDI team members received the award for the Department of History and Social siences as well as the university wide award for excellent teaching. The award ceremony took place on November 20, 2017. 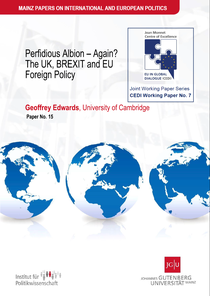 The paper explores factors behind the critique of the UK as being perfidious and awkward. It examines Britain’s core beliefs of being a global rather than merely a European power, of having a special relationship with the United States, of being internationalist in terms of trade and, somewhat paradoxically, of taking pride in being pragmatic. These beliefs have led to the rejection of blueprints for integration and a preference for bilateral cooperation rather than multilateral relationships. The Jean Monnet Centre of Excellence „EU in Global Dialogue“ (CEDI) (Dr. Carlos Santana and Prof. Dr. Michèle Knodt) organized the fourth workshop of the CEDI Workshop Series on the topic "Energy and State Capacities in BRIC Countries". 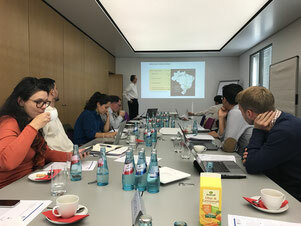 The Workshop focused on the question: Which kind of state capacity theory can be produced to explain the meteoric rise of these new emerging economies? Perhaps one of the most relevant aspects of infrastructure for understanding the state capacity of BRIC countries is energy policy. Energy security is geopolitically important for each of the BRIC and energy prices have been used to cushion social and economic shocks. Brazil, Russia, India and China all share certain traits with respect to their energy supply chain's productive structure. The study of energy in BRIC countries involves an evaluation of the physical infrastructure but also financing and bureaucratic support as important determinants of state capacity. Infrastructure facilities demand large investments which usually exceed budgetary capacities and electoral cycles. The comparative political economy literature has emphasized the role of national finance structures and seeks to show the advantages from a system coordinated by policy banks' loans as a useful instrument to overcoming technology lags in production regimes. Such studies have emphasized the role of institutional complementarities among domestic systems of financing, industrial and labor relations, and innovation to describe specific trajectories of development. The main goal of this workshop was to gather the commonalities in terms of the domestic institutional complementarities among BRIC countries based on analysis of the energy infrastructure of these countries. International Workshop: "Energy and State Capacities in BRIC Countries"
The Jean Monnet Centre of Excellence „EU in Global Dialogue“ (CEDI) organizes an international Workshop on the topic "Energy and State Capacities in BRIC Countries". The Workshop will focus on the question: Which kind of state capacity theory can be produced to explain the meteoric rise of these new emerging economies? The second CEDI Annual Conference was held in Darmstadt on 7th July 2017. 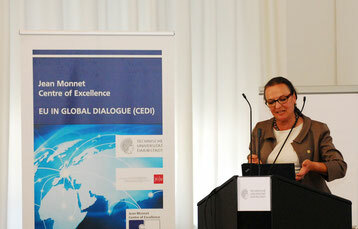 CEDI members Prof. Dr. Viola Schmid, LL.M. (Harvard) and Prof. Dr. Dirk Schiereck presented the conference “Right to and granted Freedom [in German: Gewa(e)hrte Freiheit] – Freedom in and through Currency”. Experts with a background in law and economics discussed challenges for freedom, (IT-)security and trust in relation to the institutions of currency , governments, justice system etc. The conference followed the innovative concept of a “Science-Practice-Conference” and aimed to foster exchange between different disciplines as well as between scientists and practitioners. 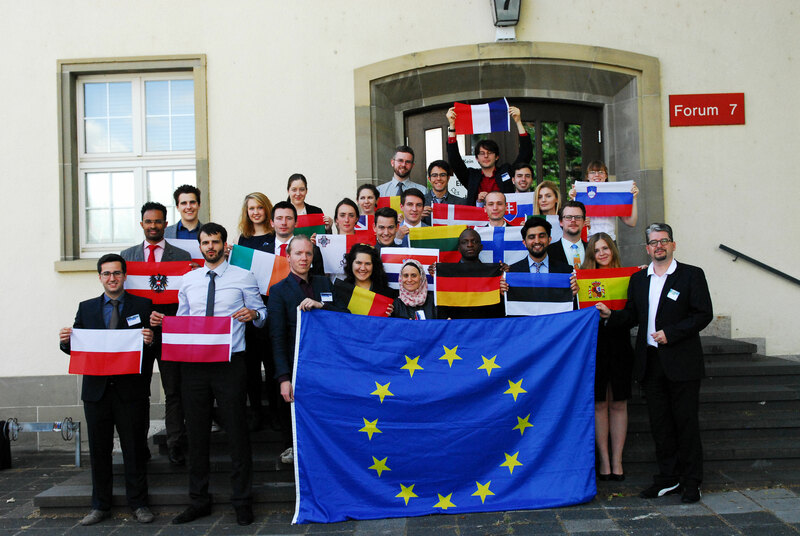 On June 29-30, 2017, CEDI hosted the third workshop of the CEDI Workshop Series at the Schader Stiftung Darmstadt.The EU is confronted with an unprecedented number of external challenges in an international environment that is becoming increasingly contested, divided and disorderly. At the same time, the EU faces severe internal conflicts and challenges that put to test core achievements and values of the European integration process. This raises the question about the future of the EU's foreign policy and its ability to deal with a new foreign policy reality. The workshop "Future EU Foreign Policy in a Changing World Order" brought together well known scholars of EU foreign policy who discussed the theme of our workshop from different analytical perspectives and policy areas. After the lecture, CEDI Director Michèle Knodt and CEDI Co-Director Arne Niemann presented the Awards for EU in Global Dialogue 2017. 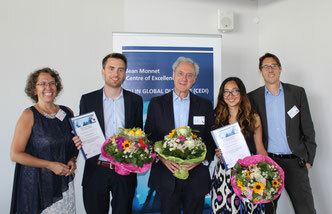 CEDI awarded two prizes to outstanding theses in political science on the topic of EU in Global Dialogue. A jury selected the theses of Asalkhon Shukurova (M.A., TU Darmstadt) on Russia's perception of Eu and Ukraine and Dr. Julian Bergmann (JGU Mainz) on the EU's effectiveness as international mediator. 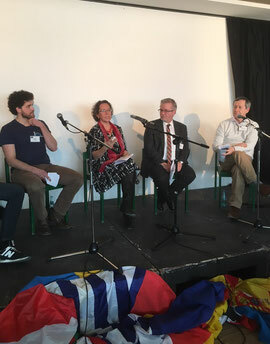 CEDI Director Michèle Knodt participated again in the yearly panel discussion organised at the Lichtenbergschule Darmstadt during Europe Week. 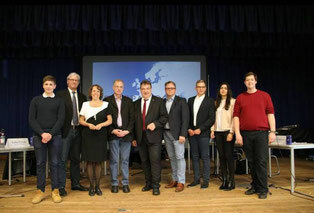 The students of the Lichtenbergschule organized a panel discussion on the topic “Europe at the move. Internal Security in Europe" that took place on May 10, during the Europe Week 2017. 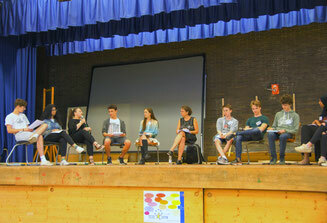 The panel included politicians, scientiest and practitioners. On June 23, 2017, CEDI's second Annual Lecture will take place at Johannes Gutenberg-Universität Mainz. Guest speaker Dr. Geoffrey Edwards (University of Cambridge, England) will give a talk on the topic "Perfidious Albion - again? Brexit and European Foreign Policy". After the lecture, the award ceremony for the Jean Monnet Awards for EU in Global Dialogue 2017 will take place. 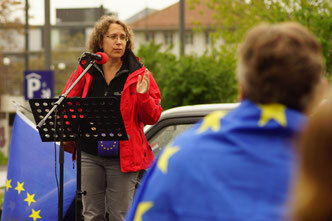 On May 7, 2017, the citizens' initative "Pulse of Europe" invited CEDI Director Michèle Knodt to give a speech on the crisis and future of the European Union. 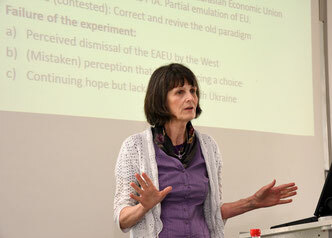 Michèle Knodt shared her insights and expertise from 25 years of research and teaching in the field of European integration studies with over 200 participants. She discussed the origins and the development of the integration project and commented on the need to show solidarity and to formulate a new European narrative. The citizen's initative "Pulse of Europe" was founded in 2016 to promote European integration and support pro-European forces in civil society. CEDI organised the second European Lounge Talk on March 15, 2017 at the Schader-Stiftung Darmstadt. The roundtable discussion focussed on new strategic challenges for a common European Foreign and Security Policy. Experts discussed the impact of Russian and American foreign policy, US-Russian relations and the effects of the Brexit on EU security policy. Speakers included Prof. Dr. Thomas Jäger (University of Cologne), Dr. Manfred Sapper (Journal Osteuropa), Dr. Annegret Bendiek (Stiftung Wissenschaft und Politik) and Protestant Military Bishop Dr. Sigurd Rink. CEDI Director Michèle Knodt and Co-Director Arne Niemann chaired the discussion. “Soft” Governance in European Energy Policy. The “Winter Package” for the Energy Union of the European Commission. The new governance mechanisms of the European energy policy proposed by the European Commission in its “Winter Package” will contribute to a redefinition of the European energy and climate governance. 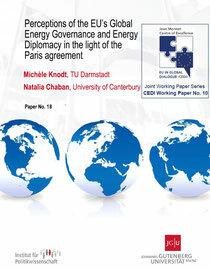 The Working Paper reviews the proposal and assesses its ability to support the European energy and climate goals. On March 15, 2017 CEDI presents the second European Lounge Talk on the topic "Between Trump and Putin: The Future of European Foreign and Security Policy". Experts from academia, politics and church representatives discuss strategic and ethical issues concerning the European approach to a common foreign and security policy. The panel discussion takes place on Wednesday, March 15, 6 pm in Darmstadt, Germany. 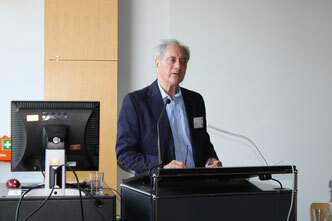 Michael Hartmann, member of the German Bundestag and member of the Bundestag's Committee on European Union Affairs, gives a talk on "Europe between Brussles, Berlin and Mainz - Insights from the Bundestag's Committee on European Union Affairs". The event takes place on Monday, July 18, 2016, 10am - 12:30 pm at JGU Mainz. After the lecture, CEDI Director Michèle Knodt and CEDI Co-Director Arne Niemann presented the 2016 Awards for EU in Global Dialogue 2016. CEDI awarded three prizes to outstanding theses in political science on the topic of EU in Global Dialogue. 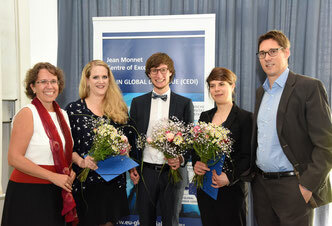 A jury selected the theses of Simon Ant (M.A., JGU Mainz), Katharina Kleinschnitger (M.A., TU Darmstadt) and Dr. Stephanie Bergbauer (JGU Mainz). New Blog Entry: "The European Union as a Peace Mediator"
On July 1, 2016, CEDIs first Annual Lecture will take place at TU Darmstadt. Guest speaker Prof. Joan DeBardeleben (Carleton University, Ottawa, Canada) will give a talk on "Shifting Paradigms in EU-Russian Relations: Can the Dialogue be Revived?" After the lecture, the award ceremony for the Jean Monnet Awards for EU in Global Dialogue 2016 will take place. 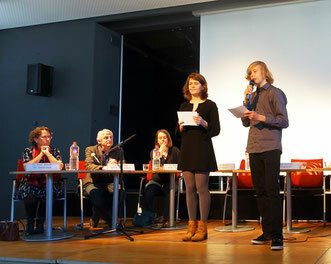 Annual conference on "Regionalism in the Global South and the EU in Comparative Perspective"
Students of the Europe School Goethe Gymnasium Bensheim organized a panel discussion on the topic “Europe on the move. Where does the EU navigate to?” that took place on May 2, during the Europe Week 2016. Moderated by Mara Krupa and Nik Seewald, Members of the European Parliament (MEP) Dr. Udo Bullmann (SPD) and Martin Häusling (Grüne), Member of the German Parliament Christine Buchholz (Die Linke), the regional head of the Europa-Union Hesse Wolfgang Freudenberger (CDU), journalist Klaus-Dieter Frankenberg (FAZ) and Prof. Dr. Michèle Knodt from CEDI discussed questions about the state of the EU. The students created video inputs and a sketch to introduce the panelists. 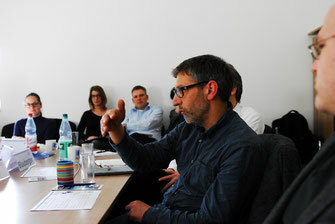 On 8 January 2016, Arne Niemann and Natascha Zaun (University of Mainz) convened a roundtable discussion on the EU’s role in the global refugee crisis and the EU’s refugee policy, bringing together scientists from different disciplines, street-level bureaucrats, civil society, and the general public. Speakers included Prof. Dr. Dietrich Thränhardt (University of Münster), Michael Richter (Author, Journalist, Film Artist), Maik Boldau (former director of a refugee reception centre in Brandenburg, Germany) and CEDI Team member Dr. Natascha Zaun (University of Mainz). 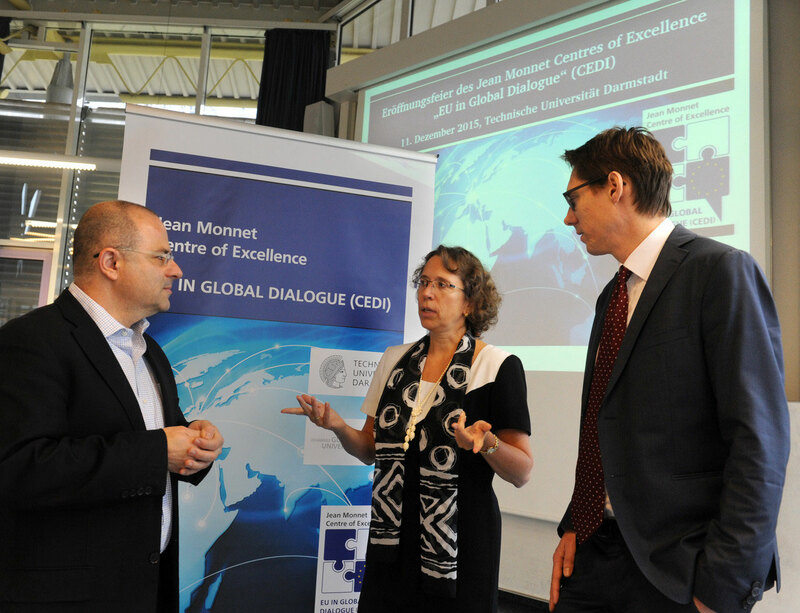 In the framework of the Jean Monnet Centre of Excellence "EU in Global Dialogue" (CEDI), the already existing research co-operation between the Jean Monnet Chairs of Prof. Dr.Michèle Knodt and Prof. Dr. Sharon Pardo was extended to teaching activities. 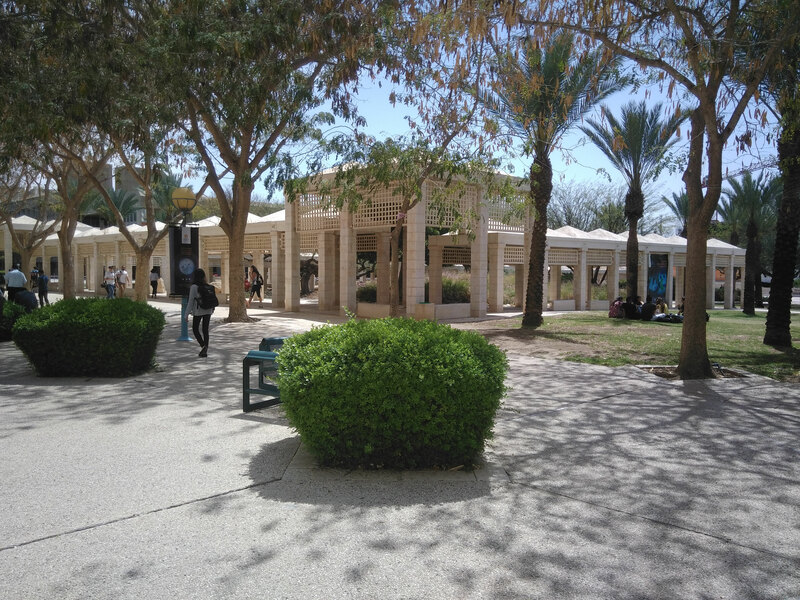 During the one-week seminar "Uneasy Neighbours: The European Union, Israel and Palestine", research students from TU Darmstadt and the University of Mainz met with other international students at the Ben-Gurion University of the Negev in Be’er Sheva, Israel. They discussed questions of territorial occupation and the influence of the Israeli-Palestinian conflict on EU foreign and domestic politics. The students were trained in theoretical, empirical and research-strategic issues on the subject matter by academics of the Ben-Gurion University. They presented and discussed their research papers with experts on the ground. The seminar was open for M.A. and doctoral students with a particular focus on the topic. The programme included field trips among others to the Kibbuz Nahal Oz near Ghaza as well as to the representations of the EU and UN in Jerusalem. 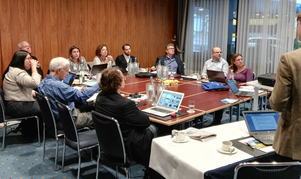 This seminar is the starting point for the development of an Erasmus+ exchange between the Institute for Political Science at TU Darmstadt and the Ben-Gurion University of the Negev in Be’er Sheva. 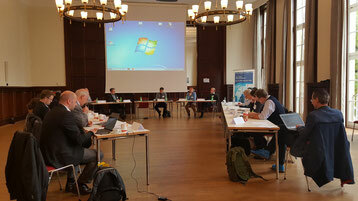 Results of the CEDI Workshop "Democratic governance of EU crises - Is it (im)possible?" On 14th and 15th April 2016 the Jean Monnet Centre of Excellence „EU in Global Dialogue“ (CEDI) organized a workshop with the topic "Democratic governance of EU crises - Is it (im)possible?" in cooperation with the Academy of Finland FiDiPro Project „Transformations of Concepts and Institutons in the European Politiy“ (TRACE). Democracy in the European multi-level system is usually discussed in the context of wether the EU as a political system has a demovratic constitution and is legitimized by it. The debate has focussed on the "democratic deficit" of the EU. The discussants came to the conclusion that the current crises have lead to an increase of the democratic deficit and have higlighted the limits of the modes of governance in the EU. 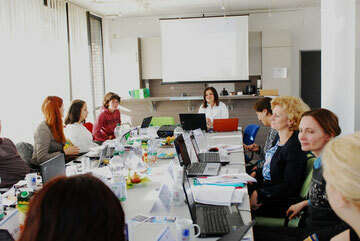 The workshop contributions discussed possible solutions for the current crises in terms of institutions and mechanisms. 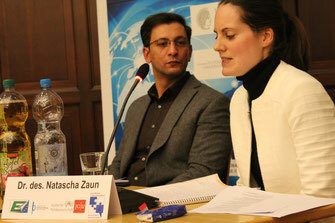 "Democratic governance of EU crises - Is it (im)possible?" CEDI awards outstanding Bachelor, Master and Docotoral theses on the topics of CEDI. The Ice Age between Cuba and the EU seems to be definitely over. After years of silence between Brussels and Havana there was a relaunch of political dialogue and cooperation in 2008 which resulted in a bilateral agreement this month. During the second visit of the High Representative of the Union for Foreign Affairs and Security Policy, Federica Mogherini, to Cuba on March 12, 2016, a "Political Dialogue and Cooperation Agreement" (PDCA) was signed which is covering political dialogue, cooperation and trade. Mogherini expressed that this is a historic step for the EU and Cuba and marks the beginning of a new phase of the bilateral relationship. Since last year, the EU is allocating €50 million within the 2014-2020 period under the EU's Development Cooperation Instrument. With this instrument the EU supports the Cuban national development strategy. Its main focus is on three sectors: food security and sustainable agriculture, environment and climate change, and sustainable economic and social modernization. In the context of this development, the Jean Monnet Centre of Excellence “EU in Global Dialogue” (CEDI) established contact and exchange with the University of Havana to have a fruitful cooperation on the topic of EU studies. Jean Monnet Professor Eduardo Perera from the History Department and Prof. Michèle Knodt from TU Darmstadt started the collaboration with a seminar on “La Union Europea en Crisis” in February at the University of Havana. 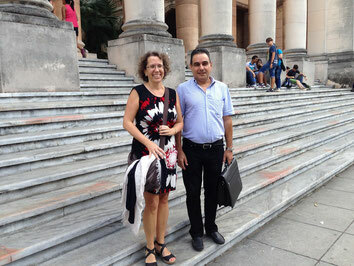 They also agreed with the Vice-Dean (responsible for international relations) of the Faculty of Social Sciences to exchange students on a regular basis. CEDI Workshop: "Democratic governance of EU crises - Is it (im)possible?" The Jean Monnet Centre of Excellence „Europe in Global Dialogue“ (CEDI) organizes a workshop on the topic "Democratic governance of EU crises - Is it (im)possible?". The workshop will focus on possible solutions of the current crises of the EU. Which mechanisms and institutions can contribute to a democratic and economically sound answer to the challenges the EU is facing? 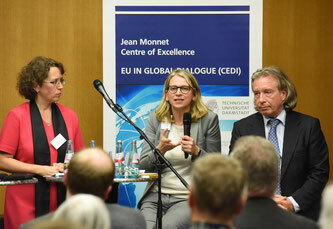 New Blog Entry: "Normative Power Europe in Global Dialogue"
New Blog Entry: "What the Belgrade-Pristina dialogue says about the EU’s role as a peace mediator"
On December 11, 2015 the CEDI Team celebrated the inauguration of the Jean Monnet Centre of Excellence „EU in Global Dialogue“ at TU Darmstadt. CEDI-Director Prof. Michèle Knodt welcomed the guests and highlighted the importance of dialogue in times of significant power shifts towards a global multipolar world order. The list of speakers included the Vice President of TU Darmstadt, Prof. Dr. Jürgen Rödel, the Vice President of JGU Mainz, Prof. Dr. Mechthild Dreyer, the Hessian State Secretary for European Affairs, Mark Weinmeister, and the representative of the State Secretary for European Affairs of Rhineland-Palatinate, Stefan Tidow. Jean Monnet Professor Sharon Pardo from the Ben-Gurion University of the Negev, presented a Keynote speech on “Normative Power Europe”. He congratulated the Team for the successful application and emphasized the need to study the impact of the EU as a normative power in the world. The inauguration marks the official start of CEDI. Please check our website and blog regularly to receive the latest news on upcoming workshops, lectures, conferences, working papers etc. From 26th to 27th November 2015, the first workshop of the CEDI Workshop Series took place at the Johannes Gutenberg University in Mainz. 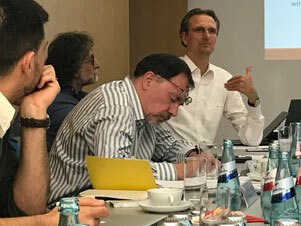 The two-day workshop on “The EU as an Actor in International Mediation – Theoretical and Empirical Perspectives” was organized by CEDI team members Arne Niemann, Julian Bergmann and Michèle Knodt. The main purpose of the workshop was to map the field of EU mediation practice and to provide the first systematic scholarly account on the EU’s role in international mediation. To understand the different facets of EU mediation, the organizers brought together researchers from various countries who presented conceptually and/or empirically oriented papers on EU mediation practice. On the first workshop day, the participants discussed theoretical and conceptual perspectives on the EU’s mediation role(s), the gender dimension of EU mediation and EU mediation practice in the Western Balkans. On the second workshop day, the main focus was on comparing various cases of EU mediation across regions, including the DR Congo, Yemen, Myanmar, and Egypt. The main scientific output of the workshop will be a special issue application with a leading international relations journal. The first workshop of the CEDI workshop series will take place at the JGU Mainz on 26/27 November. 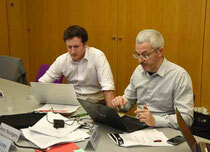 It is organized by CEDI Team members Arne Niemann, Julian Bergmann and Michèle Knodt. The workshop aims to address several remaining gaps by providing the first systematic scholarly account of the EU's role in international mediation. Since the beginning of the 2000s, the EU started to directly support peace negotiations in a variety of inter- and intra-state conflicts. In addition to its involvement as a direct leader or co-mediator in peace negotiations, the EU has also supported peace processes by providing information and communication channels to conflict parties, facilitating dialogue between opposing political parties in post-election crises or enabling and promoting mediation efforts of other international actors. The workshop organizers seek to discuss the wide variety of facets of EU activities in international mediation. The aim is to grasp the different roles the EU plays in the field of international mediation and to understand the motives and strategies that drive EU mediation activities. 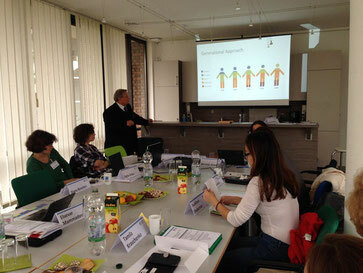 From 2 to 6 November 2015 a workshop on mutual perceptions analysis took place at the Technical University in Darmstadt. The workshop was lead by Prof. Dr. Michèle Knodt (TU Darmstadt) and Prof. Dr. Natalia Chaban from the University of Canterbury, New Zealand. Researchers from all Eastern Partnership countries as well as from the Technical University of Darmstadt participated in the workshop. The Eastern Partnership is a joint initiative of the EU and its Eastern European partners: Armenia, Azerbaijan, Belarus, Georgia, the Republic of Moldova and Ukraine. 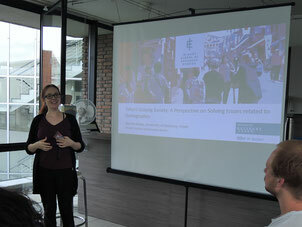 In addition, Master students of TU Darmstadt took part in the workshop as well. Prof. Dr. Natalia Chaban gave an in-depth introduction to the theoretical framework of perception analysis and then taught the participants how to apply the method in the context of their respective home countries. The goal of the project financed by the Federal Foreign Office of Germany in which the workshop took place is to get a broad picture on mutual percpetions of EU Eastern Partnership countries, Russia and the EU by media analysis. On 2 November 2015 Prof. Anatoliy Chaban of the Cherkasy National University held a speech on "Ukraine's relations to the European Union and Russia" at the Technical University of Darmstadt. He presented both background information on this triangular relationship as well as an overview of the state of the art in this field. Futhermore the audience was given a broad overview on today's developments in Ukraine. On October 6th, the Jean Monnet Centre for Europe in Global Dialogue (CEDI) was officially constituted in its first kick-off workshop with all team members. 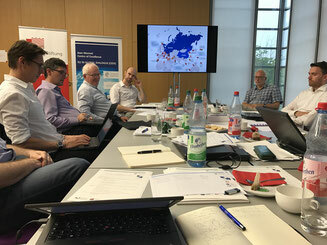 The CEDI directors Prof. Dr. Michèle Knodt (TU Darmstadt) and Prof. Dr. Arne Nieman (JGU Mainz) introduced the Centre concept and discussed the work plan and upcoming CEDI activities. The team members from the two universities look forward to a fruitful cooperation on topics of EU in Global Dialogue. The first CEDI workshop will already take place 26th – 27th November at JGU Mainz on „The EU’s Involvement in International Mediation Efforts“.